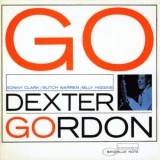 Go is ranked as the best album by Dexter Gordon. Members who like this album also like: Kind Of Blue by Miles Davis, Are You Experienced by The Jimi Hendrix Experience and The Black Saint And The Sinner Lady by Charles Mingus. Related links: top tracks by Dexter Gordontop tracks of the 1960s, top tracks of 1962. Showing latest 5 ratings for this album. | Show all 87 ratings for this album. Thrilling jazz album. Full of great tunes and performances. A great record. Updating Charlie Parker's innovative alto-style to the tenor, Gordon, aided by a brilliant piano quartet, uses dissonance to great effect. Under Gordon's direction, the tenor has rarely sounded so emphatically alive as it does on 'Go'. This was the album that introduced me to the greatness of the 'Blue Note' label. I agree. One of the greatest jazz albums of all-time.